Part 1 General issues: Modelling of materials for sports equipment; Non-destructive testing of sports equipment: The use of infrared thermography; Materials and design for sports apparel; Protective helmets in sports; Mouth protection in sports. Part 2 Specific sports: Design and materials in baseball; Design and materials in snowboarding; Design and materials in ice hockey; Design and materials in fly fishing; Design and materials in archery; Design and materials in rowing; Design and materials in athletics equipment; Design and materials in fitness equipment. 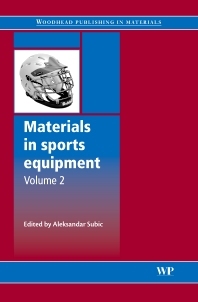 The first volume of Materials in sports equipment has become an essential reference describing improvements in materials technology and their impact on equipment in a range of sports. This second volume combines coverage of recent developments in advanced materials and their application in a number of sports not covered in Volume one. Part one discusses general issues such as modelling of materials behaviour in sports equipment, non-destructive testing methods, materials and design for sports apparel and mouth and skull protection. Part two analyses the materials and design of equipment used for specific sports: baseball, snowboarding, ice hockey, fly fishing, archery and rowing. The book also reviews design and materials in athletics and fitness equipment. This book is a unique and essential reference to all materials scientists and sports equipment designers and manufacturers developing products in this rapidly evolving field. Professor Aleksandar Subic is the Chair of Mechanical Design and Head of Mechanical and Automotive Engineering at RMIT University in Melbourne, Australia. He is currently the Chairman of the International Sports Engineering Association (ISEA) and Editor-in-Chief of the International Journal of Sustainable Design. Professor Subic is internationally respected for his research in the field of sports engineering.